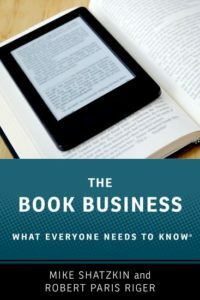 On Tuesday night, March 12, I’ll be enjoying a party thrown by my publisher Oxford University Press at The Strand Bookstore (email [email protected] if you want to come) for “The Book Business: What Everyone Needs to Know”, which I co-authored with Robert Paris Riger. This event follows our delivery of the complete manuscript by about 15 months and the untimely death of my brilliant co-author by about 14 months. And it is almost exactly a year since we held a memorial for Robert in another bookstore, Rizzoli’s. Because I’m very proud of the book Robert directed us to write, which is an accurate description of how it was created, it seemed worthwhile to describe a bit of the process that led to it. OUP editor Lucy Randall came to me a couple of years ago and explained Oxford’s “What Everyone Needs to Know” series, Q&As to provide a core understanding of a subject. They wanted me to do “Book Publishing”. I said, “but I’ll need a co-author to manage the project and to tell me what to do. I can’t actually manage anything with a lengthy timeline and moving parts.” That’s how we enlisted Robert. I first met Robert Riger in 1990, when he was about 30. He had already run both of the big book clubs: Book-of-the-Month Club and the Literary Guild. In other words, he was obviously extraordinary. He had just formed a consulting company called Market Partners International with my friend and his first boss, Lorraine Shanley, and a publishing veteran named Connie Sayre. He had a great wit and a great brain and an endless interest in exploring new ideas. Soon, Market Partners and I were working with a third consulting entity, Dan McNamee’s Publishing and Media Group, to create the first conferences exploring trade publishing’s forthcoming relationship with electronic distribution and marketing. Robert and I remained friends and interacted professionally over the years as he moved on from Market Partners: to Penguin doing early digital work with them and then for a long run working with Dan Weiss at the SparkNotes division of Barnes & Noble. After that, Robert ran the Pimsleur language program for Simon & Schuster (part of the explanation for how smart he got about audio) for several years and had just moved back to consulting from that job when this opportunity to work together arose. “The Business of Publishing” is intended to explain and demystify the deceptively complicated business of trade book publishing. Both Robert and I were skeptics about many very ingrained practices, but we wanted to give a clear account about how things really worked, even when we thought they might work better if they worked differently. What I believe we got across is that the challenge in publishing is its granularity and complexity. Every book presents the temptation to make an infinite number of decisions (which must be resisted). So standardizing decision-making is necessary. But so is then customizing them. Robert was, of course, eager to co-author this book with me and delighted that I really meant it when I said he would run the project. The book, as I hope you will see, is presented entirely in a question-and-answer format. So first we had to decide what the chapter headings were, then we had to write the questions for each chapter, and then we had to write the answers. After we got the initial chapter list, what would happen is that Robert would throw me a chapter with a few questions and say “write some more”. Then when we had questions for all the chapters, he’d throw me questions and say “write answers”. We had weekly sessions at my home office where we’d sit across from each other and talk and write. Sometimes we got things done between the sessions and sometimes we were supposed to but we didn’t. I never really had the big picture: I just wrote, reviewed, or discussed what Robert told me was needed from me next. Randall. We missed the contractual deadline, got a six-month extension, and then were only a couple of months late with that. It turns out we beat the critical deadline, though, because we got the book finished before the flu ended Robert’s life in January of 2018. 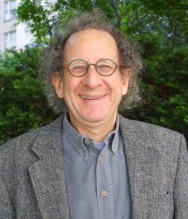 In the immediate aftermath of Robert’s passing, the peer review rigor of our publisher OUP surfaced some issues that needed clarification. In fact, I had to get help from Lorraine and Connie to process some of them because they were questions about book clubs or audio, areas where Robert was an expert and I am not. The peer review questions and some subsequent proofreading that he would have done were the chores my partner left me. They were dispensed with. It is just too bad that he’s not around for the conversations the book will now provoke, which is the fun part. It is my hope, and my belief, that “The Business of Publishing” will for some time to come help most people in publishing better understand the environment they live in. And I’m still working on the environment we ALL live in. The Energy Innovation and Carbon Dividend Act of 2019 deserves support from everybody concerned about climate change. I explain it and push it in a post in another venue.